It was a helluva time coming, but Auburn did it. The Tigers got their first home sweep over Mississippi State since 1985 and the first home sweep over an SEC opponent since 2002 (Vanderbilt). It was a thrilling series, complete with a record-setting 7 HR performance on Saturday and game closing/saving performances on all three days. There are just two weekends left in the SEC slate and Auburn hasn’t guaranteed their ticket to Hoover yet, but the Tigers have eliminated 3 teams from catching them (Mississippi State, Kentucky, and Georgia). Those are the only certainties. Mathematically Auburn still have a chance of missing out of the SEC tournament. Realistically however, that’s not going to happen. 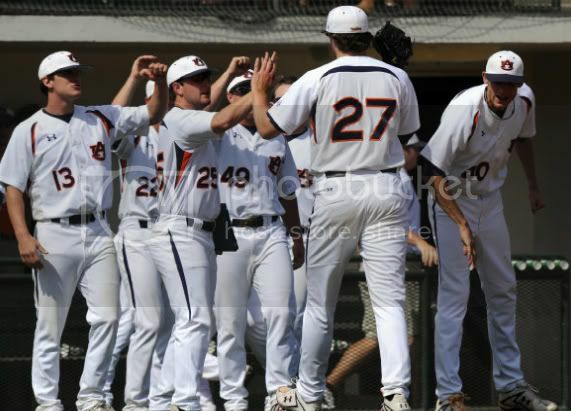 Auburn is going to Hoover. It would take an absolute 6 game collapse and some unlikely upsets for Auburn to fail to make Hoover. Back to this weekend. I don’t want to be Debbie Downer here because ultimately a win is a win but with all the excitement of Auburn hitting 7 HRs on Saturday and outslugging State all weekend, there was some things that gave me pause. Auburn pitching got absolutely rocked by State in games that honestly shouldn’t have even been close. The 28 runs was the second highest combined SEC run total for MSU all year. The Dogs scored 23 against Ole Miss, 17 against Bama, 38 against UT, 12 against Carolina, 24 against Georgia, and 7 against Florida. 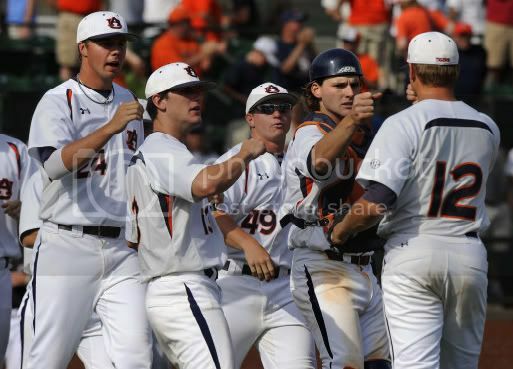 That might not seem like a big deal, but for an Auburn team that has been searching for pitching positives, this weekend wasn’t one. Granted, I could be overanalyzing this but I’m not sure how a staff that limited one of the best offenses in the SEC a weekend before was unable to cruise against the second worse team in the league. Maybe it was rust as the Tigers had their first full week without baseball in-between games. Maybe it was just the way the weekend was going to play out. I don’t know. I just know that Auburn still hasn’t found a Saturday starter, our bullpen wasn’t as sharp as it has been, and Auburn can’t continue to rely on Austin Hubbard to bail out games because, although Hubs is a workhorse, when his pitch count gets up he’s less effective. I saw that against LSU and against UK. Austin has sneaky stuff (especially his slider) but he can get overworked really easily. The other thing was the Tigers offensive philosophy/strategy. The small ball approach was completely absent. I only saw one hit-and-run and don’t know how many stolen bases Auburn attempted. Instead, Auburn went back to last years gAUrilla ball approach. Ultimately however, it doesn’t matter. Auburn won. That’s all that matters. A win in a 3-1 ball game is the same as a win in a 16-14 ball game. They look the same at the end of the day. Maybe that’s the real problem: that it’s not even a problem at all. Auburn has come on so strong over the past few weekends that I’m having to look for something/anything to be critical about. I always prescribe to the philosophy of “if you’re not improving something then you are declining somewhere else”. What else did I see this weekend? I saw a team that didn’t fold. 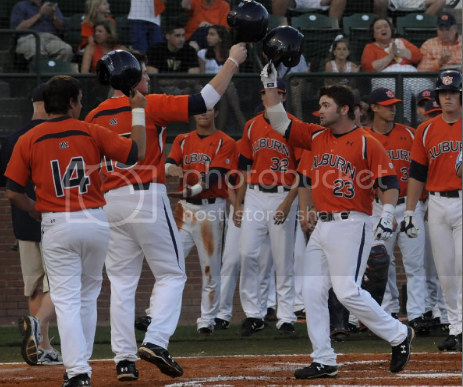 Even after being down 9-0, Auburn rallied. Even after State would pull uncomfortably close, Auburn would pull away. Justin Fradejas saw his hitting streak come to an end. It was bound to happen, but when it did he received a nice standing ovation from the Auburn crowd. The Auburn crowd? Definitely electric. 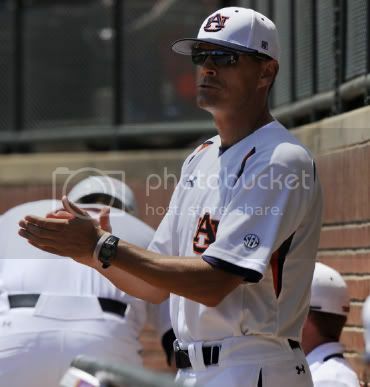 The players and coaches commented on it in the postgame how the fans stuck around on Saturday even after Auburn was looking at a nine run deficit. Finally, Kevin Patterson. KP is such an oddity. Normally, walks aren’t much cause for celebration but for Patterson it was. Late in the Saturday game, Matt Lane, a LHP for MSU came in on relief. Normally, this would be a situation where Pawlowski would lift KP based on his struggles against LHP. Instead, he left Patterson in there and KP worked a walk. To me, that’s a sign of improvement and it might be a reason to keep KP in against LHP. His power has definitely shown that he should be there. Personally, I wish KP would stay for his Senior Year. He’d be guaranteed 1B and would have a full season to break records and improve his draft stock. That decision will ultimately be left up to him. HITTER OF THE WEEK: I have to give this to Ryan Jenkins. He just continues to come on hot. This weekend Jenks went 7 for 12 (.583) with 3 runs scored, 6 RBI, 2 doubles, and a HR. Pretty solid. He’s brought his average all the way up to .353. PITCHER OF THE WEEK: Austin Hubbard would be the obvious choice. The closer recorded 2 big saves but also shut the door Friday in a non-save situation. However, I got to go with Cole Nelson who responded with his “demotion” to the bullpen by going 1.1 innings with 1 BB/1 h/and 3 K. It was a dominating performance that Auburn had been missing all weekend out of the bullpen. JOBUS: 4 out of 4 of them. Auburn is rolling.